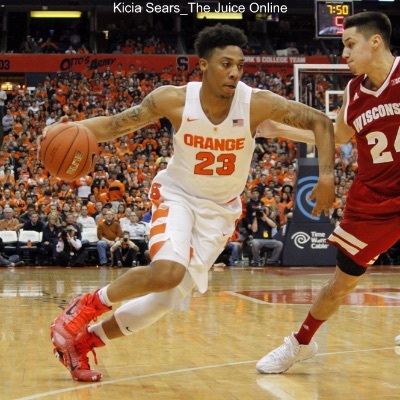 HomeBasketballIs eight enough for 2016-17 Syracuse basketball? With Malachi Richardson officially staying in the NBA draft, the 2016-2017 Syracuse men’s basketball team lists eight players officially on scholarship: Tyus Battle, Paschal Chukwu, DaJuan Coleman, John Gillon, Frank Howard, Tyler Lydon, Matthew Moyer, and Tyler Roberson. If some of those names seem unfamiliar to you, it is understandable. Battle and Moyer are Orange recruiting class, Chukwu spent this past season sitting out following his transfer from Providence after his freshman year, and Gillon joins SU for a season as a post-graduate transfer. While there are some potential additions to the program still out there, the list of remaining potential graduate transfers is uninspiring and it is hard to say if Taurean Thompson, a 6’10” forward from Brewster Academy (shout out to C.J. Fair) will commit to Syracuse. Putting aside a walk-on or two being granted a surprise, it is quite possible that the Orange will head into the season with eight scholarship players. So, if you like to grouse about Jim Boeheim’s short bench, you’re probably best served leaving your complaints in mothballs. But, how will those eight players be deployed and are their any issues to be covered up? Let’s take an early look. There are three guards among the eight, but none is a true point guard. Frank Howard showed the ability to create for others late last season, so he will definitely get a look at the point guard spot. Add in that he is the only one of the three with playing experience in the 2-3 zone and he looks like he will get significant minutes. Tyus Battle is a 6’6” combo guard who is a better scorer than set-up man, but can still handle the point for short spurts. Battle averaged over 19 points, nine rebounds, and five assists per game en route to being the Gatorade Player of the Year in New Jersey and is expected to at least be in the rotation from the jump. John Gillon is the wild card and you can argue both sides of the coin from his player page. Statistically, he looks like a nice addition: over 1,000 points combined in two seasons at Colorado State and one at Arkansas-Little Rock, 36.4 percent on threes and 83.5 percent on free throws in his career, and almost four assists per game last season. Then, you see that he is listed at 6’0” and start to wonder about his lack of height at the top of the zone. It is hard to imagine a scenario where Gillon does not play, though. His experience and shooting (Howard, while certainly not as bad as his stat line last year suggests, is still not as good as Gillon) pretty much guarantee him some playing time. Besides, if he were not going to play, why would the coaching staff court him and why would he come? For the frontcourt, it will be a two-headed monster at center and “A Tale of Two Tylers”. DaJuan Coleman and Paschal Chukwu will split the minutes at center. The two will soak up 40 minutes at center, barring Boeheim opting for a small lineup. Coleman will provide a little more bulk and offense while Chukwu will be the super-sized shotblocker on the baseline. While they return to starting roles, both Tyler Lydon and Tyler Roberson each face one big question on the offensive end, though. 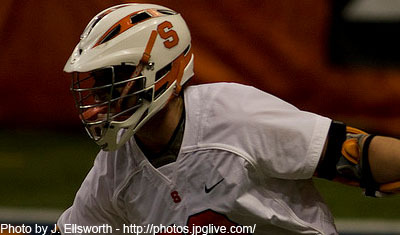 For Lydon, it is about how he adjusts to the role as the top offensive option. Lydon had stretches where he was deferential last season, but now must be the alpha dog as a sophomore. While there is no clear substitution for Roberson this year unless Boeheim believes he can get away with Battle or Matthew Moyer at forward, he has to show more on offense. With one of Coleman or Chukwu on the floor at all times, there will always be congestion in the key, even in the form of a sagging big man on defense. A more consistent mid-range jump shot would carry Roberson a long way. Matthew Moyer looks to be the last man in the rotation. While he fits the casting call for a traditional Syracuse forward, there likely will be scant few opportunities for Moyer. With Lydon and Roberson eating up most of the minutes at forward, Boeheim will likely work Battle in for a few minutes at a time on the baseline, if necessary, if only to keep more offense, particularly perimeter shooting, on the floor. But, that brings up an issue. Should a starting forward get into significant foul trouble, Boeheim has a tough decision (on paper, anyway) about what to do. Neither Coleman or Chukwu should be at a forward spot, closing out on shooters in the corners. That role is an unnecessary burden on Coleman’s knees and putting Chukwu out there neutralizes a large part of his shotblocking threat. And going to Battle at forward means Howard and Gillon, the two shortest scholarship players, are up top. Howard’s size is not an issue, but Gillon creates a minor one. A theoretical fix is to play Chukwu behind Howard and Gillon. His length allows him to play higher up in the key and be a deterrent at the foul line while offering some rim protection. Howard and Gillon could then move out a step to take away open three-point looks. Still, there might be a bigger issue on offense. Trevor Cooney, Michael Gbinije, and Malachi Richardson combined for 1,331 field goal attempts last year, which is just under 64 percent of the team’s total. Who’s going to pick up the slack? Lydon should easily become at least a 15-point per game scorer after averaging a shade over ten a game as a freshman. He averaged seven field goal attempts a game last season, but the team’s leader (Gbinije) averaged 13. Lydon will likely be less efficient with a heavier load, but the number of shots alone should push him above 15 points per game. But, beyond him, is there anyone else who counts as a sure thing on offense? Gillon averaged 13.2 points per game last season for Colorado State last year, good for third on a team that finished 18-16 in the Mountain West. He is streaky, though, cracking the 20-point barrier four times, but also finishing with four or fewer points five times. Late in the season, Gillon showed the ability to string together strong offensive performances, finishing in double digits 11 times in the Rams’ last dozen games. Roberson finished with just under nine points a game last year, but the chances of him increasing that output still seem to rely on him chasing down rebounds for putbacks. Coleman might be able to give the offense eight points a game. Neither player looks like one Boeheim will hitch a wagon to. So, that leaves Battle. He will likely resemble Richardson on the floor, given essentially a green light to shoot from the jump. 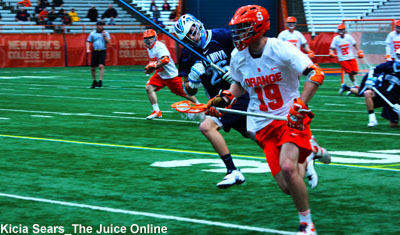 The Orange will simply need the boost on offense and Boeheim has never been scared to give a freshman the ball. It will likely be ugly at times on offense and the inexperience of the guards could be an issue on defense, but the team should be able to make things work with the current roster. More help could not hurt.